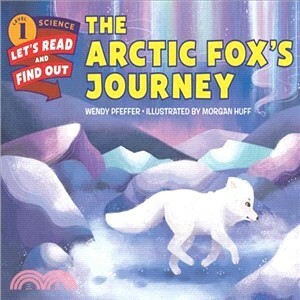 The Arctic Fox’s Journey is a picture book in the award-winning Let’s-Read-and-Find-Out series about the arctic fox’s dangerous winter journey. During the winter, the arctic fox begins an incredible journey. She heads north through the tundra, toward the top of the world. No larger than a house cat, she faces treacherous obstacles, frightening predators, and bitter cold along the way. It seems impossible that she could persist against the elements on her almost 2,000-mile journey—but she does. Read and find out about the arctic fox’s quest for survival. Wendy Pfeffer is the author of several titles in the Let’s Read and Find Out Science series, including From Tadpole to Frog, What’s It Like to Be a Fish?, From Seed to Pumpkin, Sounds All Around, Light Is All Around You, Wiggling Worms at Work, Dolphin Talk, and Life in a Coral Reef. She lives in Pennington. NJ, and enjoys making author visits to schools. You can visit her online at www.author-illustrator-source.com/wendy-pfeffer.html. Morgan Huff is an artist who specializes in children’s illustration. She loves to draw creatures of all shapes and sizes—foxes in particular! When she’s not making art, Morgan can be found drinking tea, munching on cake, and reading. She lives in a small town on the central coast of California.